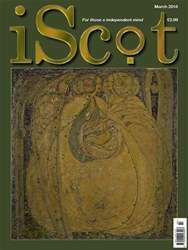 Digital Subscriptions > iScot Magazine > March 2018 > Devolution Differences for the Disabled? As someone with several health conditions which cause a measure of disability, I wanted to share a recent experience with iScot readers. But first, I’ll make some relevant points. The disability benefit called Personal Independence Payment (PIP) is devolved now to the Scottish Government. Its purpose is to meet the extra daily living expenses incurred in coping with disability. Employment Support Allowance (ESA) is the other main disability benefit which is aimed at getting the disabled into gainful employment and comes complete with Work Coaches with whom you meet regularly to plan and agree work-related steps such as entering unpaid work experience stacking shelves at Poundlands, and similar exciting opportunities. ESA is reserved to Westminster.